But don't just take our word for it. Sharky's is proud to be voted the Best Sports Bar for the last EIGHT YEARS on the Dallas A-List. Call your shots on one of nine oversized 8 foot pool tables or 2 quarter tables. Strike up a casual game of shuffleboard, darts, ping pong, tikki toss. Hit Golden Tee or Silver Strike Bowling. Sharky's has 9 oversized 8 foot pool tables. Bring your friends for a game, or join the APA league and show 'em what you've got! Sharky's menu offers something for everyone, including Sharky's burgers, wings, potato skins, house-smoked brisket, lots of great bar appetizers, salads and much more! Racking Up Good Times for Over 27 years! Sharky's is ready for all fan bases to watch and cheer for their favorite teams with pristine sound that is synced to Sharky’s big screen televisions while enjoying a burger or jalepeño poppers at Sharky’s U-shaped bar. The seamless viewing experience is made possible through Audiofetch, which allows real time audio from TVs or any aural source straight to your Apple® or Android® Smartphone. Users download the AudioFetch App at iTunes® or Google Play® Stores and once installed, the phone acoustic and TV video synchronize together. Audiofetch guarantees low auditory latency. Bring your earbuds! Try our nightly specials and join us every day for Happy Hour from 11:30 AM to 9 PM. Voted the "Best Sports Bar in North Texas, 2009-2017" by WFAA-LIST, Dallas Observer's "GoTime.com #1 Ranked Happy Hour in North Dallas", and the "Best Sports Bar In Dallas, Texas" by MSN.com. Come join our active karaoke crowd on Thursdays and Saturdays from 9:30 PM to 1:30 AM! Shoot some pool, throw some darts, play shuffleboard, ping pong, exercise your brain with NTN Trivia, play NTN Texas Hold'em, Golden Tee, Silver Strike and tikki toss. 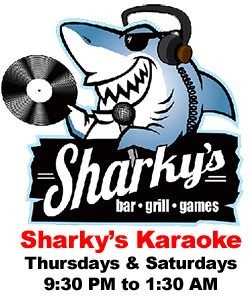 Sharky's is AWESOME for company happy hours and adult birthday parties - call to schedule! Join Us for the Party on the Patio!